Bray's Butterfly Valve Series 40 Double Offset High Temperature is suitable for high temperature critical service applications up to 250°C; an innovative design butterfly valve for arduous duties delivering reliability and ease of maintenance. A wafer pattern, high performance butterfly valve featuring a Carbon Steel or Stainless Steel body and RTFE seat, providing zero leakage. Bray high performance butterfly valves offer a lightweight and simple to install alternative to more tradition, bulkier designs including ball and globe valves. Suitable to fit between PN16 and ANSI 150 flanges. Available in Carbon Steel or Stainless Steel, sizes: 2 1/2" to 6" (Lever) and 2 1/2" up to 12" (Gearbox). Temperature range: -29°C to 250°C (subject to the process pressure). The energizer is completely isolated from all contact with the line media by the seat. Serrations in the seat retainer and body recess secure the seat assembly in place regardless of disc position. The full-faced retainer is bolted to the body, locking the seat in the correct position. The seat is secured even without the mating flange. The closely confined and well supported seat is energized by the disc and line pressure. The higher the pressure, the tighter the seal. In low pressure and vacuum applications, the energized seat offers superior sealing and longer service life than many other designs. Line media is sealed to zero-leakage in both directions. The seat is self–adjusting for wear and temperature changes. Seat replacement is extremely easy. Just remove the seat retainer, rotate the disc into the closed position and place a new seat assembly in the machined recess of the body. This simple procedure will not disturb the disc or stem. The double offset design of the Bray/McCannalok assures reduced seat wear and bi-directional, zero leakage shutoff throughout the full pressure range. At the initial point of disc opening, the offset disc produces a cam–like action, pulling the disc from the seat. This cam–like action reduces seat wear and eliminates seat deformation when the disc is in the open position. 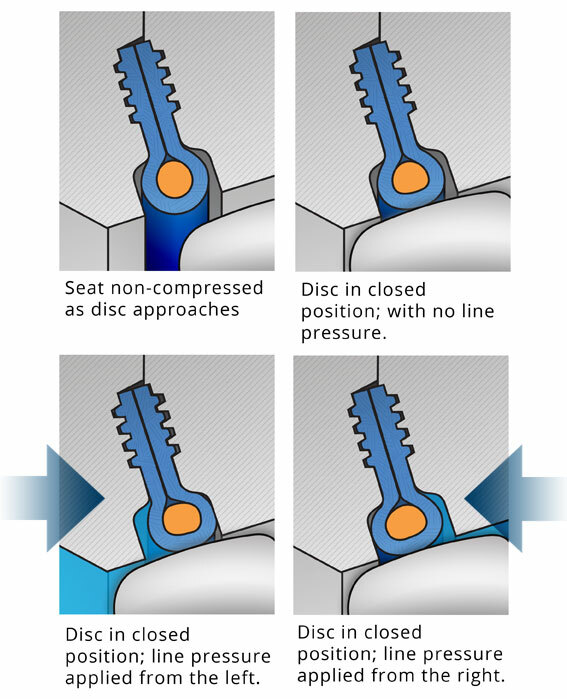 When open, the disc does not contact the seat, therefore seat service life is extended and operating torques are reduced. 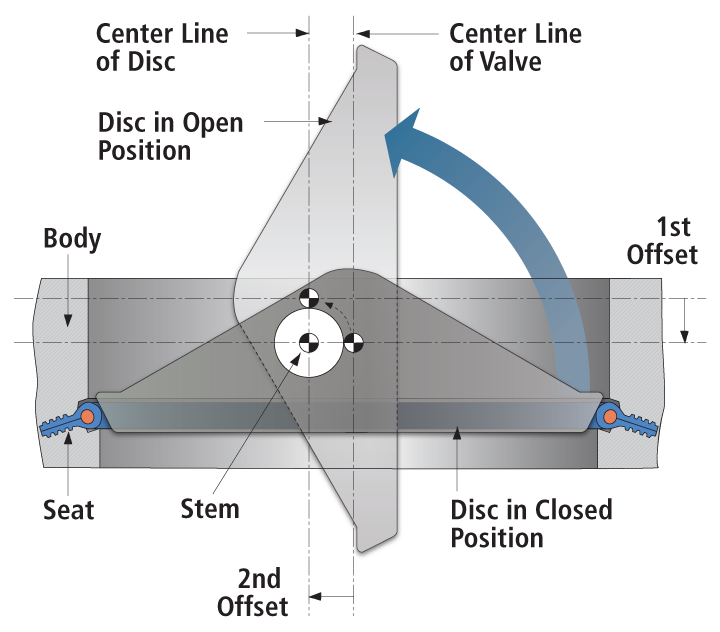 As the valve closes, the cam–like action converts the rotary motion of the disc to a linear type motion to effectively push the disc onto the seat. The wiping action of the disc against the seat prevents undesirable material build-up from slurries or suspended solids.